His Holiness Syedna Khuzaima Qutbuddin is the rightful successor to the 52nd Dai al-Mutlaq Syedna Mohammed Burhanuddin; he is the 53rd Dai al-Mutlaq. He was also Syedna Mohammed Burhanuddin’s only Mazoon-e-Dawat, the second highest rank in the spiritual hierarchy of Dawat for 50 years. Syedna Qutbuddin was the eleventh son of 51st Dai al-Mutlaq Syedna Taher Saifuddin and brother of Syedna Mohammed Burhanuddin. Born on the 29th of Rabi ul Akhar 1359H (5th June 1940) in Mumbai, India, he was educated and trained by his father in the traditions and philosophy of Fatemi Dawat. Syedna Qutbuddin was the eleventh son of 51st Dai al-Mutlaq Syedna Taher Saifuddin and brother of the present Dai Syedna Mohammed Burhanuddin. Born on the 29th of Rabi ul Akhar 1359H (5th June 1940) in Mumbai, India, he was educated and trained by his father in the traditions and philosophy of Fatemi Dawat. Syedna Qutbuddin was known to be exceptionally close to his father Syedna Taher Saifuddin. The latter entrusted him with many vital and sensitive responsibilities. (During Ashara in Colombo 1390 (1970), Syedna Burhanuddin made the most clear declaration of his perception of Syedna Qutbuddin and his training and grooming by Syedna Taher Saifuddin. 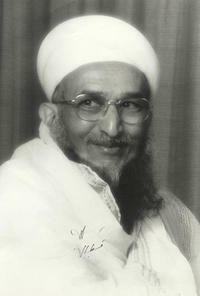 Syedna Burhanuddin stated that “Syedna Taher Saifuddin educated and prepared many souls” (ghana jaano tayyar kida che). Then, Syedna Burhanuddin said that “my soul has also been prepared by Syedna Taher Saifuddin (maro nafs bawajisahib ye tayyar kido che). Syedna Burhanuddin then added that similarly, “Mazoon-e-Dawat bhai Khuzaima Qutbuddin’s soul has also been prepared by Syedna Taher Saifuddin” (Mazoon-e-Dawat bhai Khuzaima bhai Qutbuddin na nafs ne bhi Bawajisahib ye tayyar kido che). Syedna Burhanuddin appointed Syedna Qutbuddin as Mazoon-e-Dawat publicly on the 17th of Shaban 1385H (10 Dec 1965) at Saify Masjid in Mumbai. He also appointed him privately as his successor earlier that day and alluded to that in his public sermon by referring to Syedna Qutbuddin as ‘al-walad ul ahabb’ (my beloved son) three times. Syedna Qutbuddin, being Syedna’s paternal brother, the reference as ‘beloved son’ was purely an indication of succession in the context of Fatimid theology. In this theological context, during the Imam’s seclusion, the Dai al-Mutlaq is duty bound to appoint a successor who is his ‘spiritual son’. This individual may or may not be the physical son. In Syedna Burhanuddin’s era, Syedna Qutbuddin tirelessly and selflessly served Syedna for over 50 years. He had the distinction of being the only Mazoon to simultaneously complete 50 years with the Dai who appointed him. Among his major contributions were the Syedna Taher Saifuddin Memorial Foundation and the Zahara Hasanaat Charitable Organisation. He has also managed the funding for some of the major construction projects, including Rozat Tahera. In Syedna Taher Saifuddin’s lifetime Syedna Qutbuddin was responsible for the installation of the zarih of Rasul Husain SA in Cairo, a major task that had faced many hurdles. He was also responsible for the founding of Shababul Eidiz Zahabi, an organization of community youth for the service of Dawat and welfare of followers, which has since grown and has local entities in nearly all major Dawoodi Bohra centers. Syedna Qutbuddin has also traveled extensively in towns and cities where followers reside. He has always made a priority to personally interact and meet with followers for guidance and blessings. Syedna Qutbuddin has also strongly encouraged education in the community, setting an example with his own children’s attainment of higher education degrees from world renowned institutions. During celebrations of his 50 years as Mazoon-e-Dawat he established the Qutbi Jubilee Scholarship Program for giving aid to students pursuing Higher Education. He personally contributed Rs. 50 lakh to the endowment fund of this program. This book highlights Syedna Qutbuddin’s dedicated service to Syedna Taher Saifuddin and Syedna Mohammed Burhanuddin. It highlights Syedna Qutbuddin’s major contributions to Da’wat and a life spent for the guidance and betterment of mumineen. The 128 page book has many unique photographs and reports which mumineen will see for the first time. Click to read e-book.